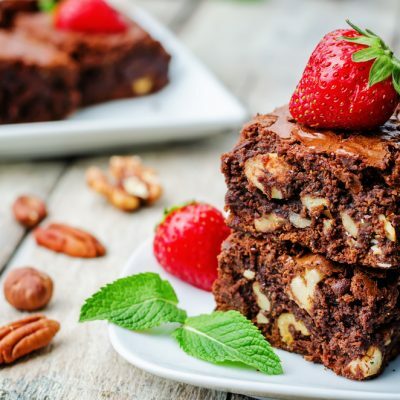 One of our favourite indulgences would have to be a batch of brownies, still warm from the oven and topped with delicious fresh fruit. This version is twice as nice with both walnuts and hazelnuts, but you can customise in and add in your favourite nuts (or leave them out entirely if you have allergies). Preheat oven to 180°C and line a brownie tin with baking paper. Beat together the Natvia, eggs, and vanilla extract until it is light and fluffy. Pour in the butter and stir together. Add the flour, baking powder, Du Chocolat, and cocoa. Fold in hazelnuts and walnuts. Pour into prepared pan and bake for 25-30 minutes until it is set a toothpick comes out almost clean. Allow to cool and cut to desired size.